INFINI is a new technology that delivers real results for skin tightening and acne scarring correction. It targets coagulation zones in aging, sagging skin with fine wrinkles. This 2 in 1 Fractional Radiofrequency (RF) System provides complete control over treatment depth and energy levels to enable a multi-layered treatment approach with no electrothermal damage to the epidermis. For a superior Acne treatment, the results are outstanding. For skin tightening, medical research has shown this is similar to a mini facelift (1/3 of a facelift for a fraction of the price and downtime). The Cosmetic and Restorative Surgery Clinic is the 2nd cosmetic clinic in Australia and the 1st cosmetic clinic in Sydney to have Infini. This is a TGA approved system and is well proven in the USA where it is FDA approved. Superior to Fraxel Laser, IINFINI's 2 handpieces allow for the delivery of the RF energy to be precisely targeted and controlled into a specific layer of the dermis up to 3.5 mm in depth. This allows the practitioner to tailor the procedure to the patient's specific treatment needs from mild to more aggressive, even in delicate areas. INFINI also has ComfortFlow™ technology to ensure that the treatment is well tolerated by patients. Micro needling fractional radio frequency (MFR) has fine needles which puncture the skin to deliver the radio frequency to the deeper levels of the dermis, providing a three dimensional delivery of energy maximizing skin volumization while dramatically tightening and rejuvenating the skin. Skin needling can only perform a part result compared to an Infini treatment. Superficial fractional radio frequency (SFR) employs a minimally invasive delivery of radiofrequency to the epidermis and dermis for resurfacing the skin and stimulating the production of collagen for a more toned and refined skin. 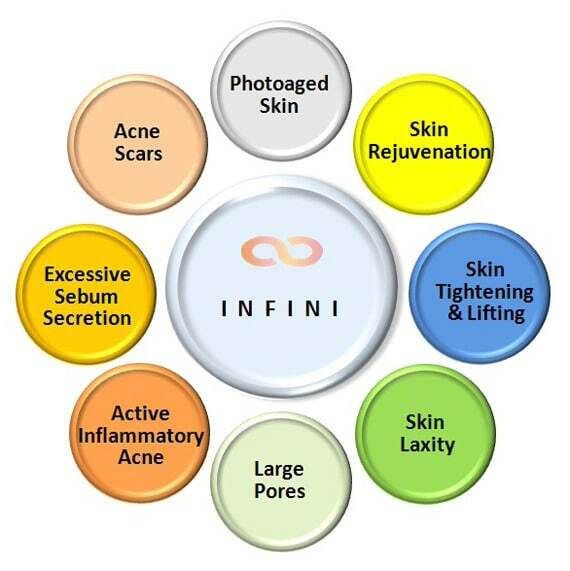 To speak to a treatment specialist to find out if INFINI is for you, fill out the form below or call the clinic on 02 9362 7400. This ‘non-surgical’ facelift is actually a non-invasive procedure suitable for the 35-55 year old age group, employing radiofrequency technology to tighten loose skin by using heat to shrink tissues and stimulate collagen growth. It is also called the ‘Thermacool Facelift’ because it has a cooling spray to protect the surface skin. No anaesthesia or down time is required and the procedure takes between one and two hours to perform. 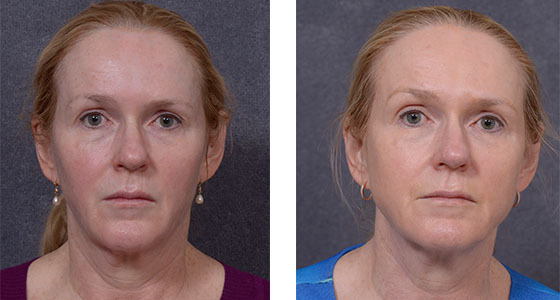 More and more people are turning to Dr Hodgkinson and his team of Specialist Cosmetic Treatment Nurses at the Cosmetic & Restorative Surgery Clinic for rejuvenation techniques, to help their face reflect the way they feel inside. One such rejuvenation technique is wrinkle relaxation treatment. It can be used to relax the specific facial muscles that cause upper facial lines (crow’s feet, forehead and glabellar frown lines) to form. Wrinkle relaxation treatment involves a natural, purified protein that relaxes wrinkle-causing muscles, creating a rejuvenated appearance. The active ingredient in wrinkle relaxation treatment is derived from bacteria in much the same way penicillin is derived from mould. It is manufactured in sterile laboratory conditions. The treatment is a prescription-only medicine and treatment is only available from a qualified medical professional such as Dr Hodgkinson and his team. It is registered for the treatment of crow’s feet (the lines that radiate from the corner of your eye when you smile or squint), forehead lines (the horizontal lines that form when you raise your eyebrows) and glabellar frown lines (the vertical lines that appear between your eyebrows when you frown). Wrinkle relaxation treatment is a non-surgical procedure whereby a small amount of product is administered into selected facial muscles by Dr Hodgkinson or one of his staff specialists using a very fine needle. Generally, the treatment takes around 10 -15 minutes. At the Cosmetic& Restorative Surgery Clinic we have used our vast experience with these treatments to develop methods to minimize any discomfort so that no anaesthetic is usually required. The injection may sting for a few seconds but normal activities can be resumed soon after. After the injection, it takes 2 -3 days for the treatment to begin taking effect and about 7 days to see the full effect. The dose recommended for the treatment will vary depending on your individual situation and the severity of your lines. Dr Hodgkinson and his staff will know what the best dose is for you and which muscles to inject to give you the best results. In addition to its use for cosmetic reasons, the product used in wrinkle relaxation treatment is also used to treat patients in a variety of therapeutic indications including cerebral palsy in children, movement disorders (head, neck, shoulder, face), and axillary hyperhidrosis (excessive underarm sweating). In the amounts used for the treatment of upper facial lines, the side effects are usually temporary and localised to the area of injection. Possible side effects include headaches, pain, burning/stinging, bruising, swelling or redness at the injection site, local muscle weakness including drooping eyelids/eyebrows, swollen eyelids, skin tightness, tingling sensations, itichiness, nausea and flu like symptoms.